Legal descriptions are scheduled for major enhancements in TPC Desktop 2014, but here are a few you have asked for now. Legal descriptions previously reported only chord direction and distance for spirals. Release 1 adds tangent and non-tangent spirals and describes them much like tangent and non-tangent curves. Tangent spirals: Courses 2 and 4 below describe the transition spirals in an out of a curve. These spirals rely on the tangents and curve that connect them. Non-Tangent spirals: Course 6 below, describes a non-tangent spiral being intersected by the line from points 5 to 6 in the drawing. Additional information is presented with the spiral since it has been defined independent of its adjacent courses. 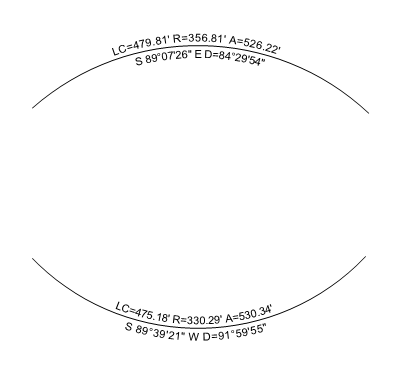 6) thence to the beginning point of a highway spiral to the left, having a beginning radius of 0.00 feet from which the radius point bears South 82° 10′ 31″ East and an ending radius of 300.00 feet, thence 520.00 feet along said spiral, said spiral having a central angle of 49° 39′ 23″ and a chord bearing of South 08° 37′ 13″ East for 502.85 feet. Legal descriptions now use the distance and direction types of the traverse they are derived from. In the following example, the traverse uses ground distance and project elevation and true bearings. These are reflected in the title of the description as shown blow. TPC describes adjacent courses differently based on their tangency. If the radial bearing of the PC of a curve is at right angles to an incoming course, that curve is considered to be ‘tangent’ to that course and is described differently than it would be if it were not tangent to that course. You can now enter your own angular limit to determine if two adjacent courses are tangent or not. As long as the difference between two directions is within this angular limit, the directions are considered to be tangent. The default value of 1 minute means that if two directions differ by more than one minute, they are not tangent. You can request the legal description to be capitalized or not. This release is more consistent in how it capitalizes all parts of the legal description. You can now choose between stacked text and arc aligned text for user drawn arcs. With the release of TPC Desktop 2013, arc aligned text was available only with survey lines created from the traverse settings. Users requested the ability to apply arc aligned text to arcs they labeled. 3. format all arc labels via Tools, Drawing Settings, Object Labels from the drawing view and specify [x] Arc Aligned. All user drawn arcs in the drawing will be labeled based on this setting. The Format Label button does the same think here that it does in the Traverse Settings dialog. It displays the drawing’s label formats for both Stacked and Arc aligned text. TPC Desktop 2013 was limited to 32 characters when arc aligning text. If the text exceeded that limit, the text was drawn in a straight line instead. Release 1 removes this limit so that text of any length can be arc aligned. All the hot fixes for TPC Desktop 2013 are included in this release. Legal descriptions now include spirals, the distance and direction type of the traverse they originate from, include a user defined tangency and improve capitalization. Starting in Release 1, we’ve included our Windows Trusted Publisher Certificate with program installs. As more and more of you download TPC from the web, we felt it was important to provide another level of security. You also enjoy greater TPC compatibility with your email and antivirus software. It’s just a little thing, but many of you have ask that TPC allow multiple lines when inserting descriptions for traverses, surfaces and drawings. With Release 1, you will be able to revoke the TPC Desktop license from your old computer and re-use it on any other computer, like the new one you just bought. We added traverse configurations which TPC automatically identifies as Closed Loop. 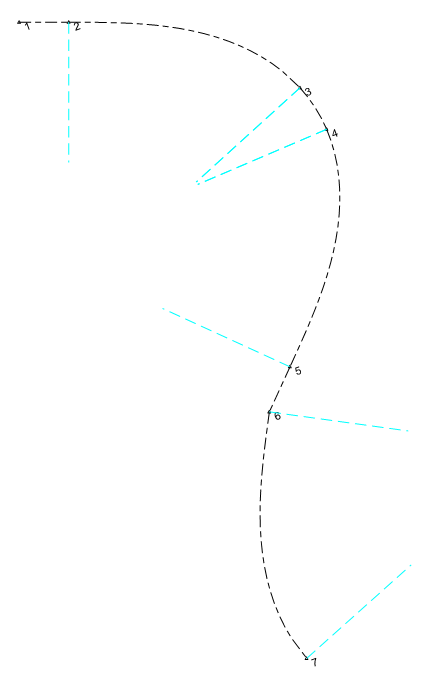 One is (1 =11, …, 1 =11) where a traverse begins and ends with the same point, which references another survey point via the “=” in the description. Automatic closures are a great new feature of TPC Desktop 2013 and we are excited about tacking down all the configurations you use and making them available in upcoming agile releases. When inserting a geodetic mid-point into a traverse via the Traverse View ‘Insert’ command, TPC now automatically applies the distance factor. Previously, the distance factor had to match the survey units. When updating raw data, the traverse units are used to create the raw distance instead of the survey units. For those of you creating PLSS field data from GPS coordinates, this is a real time saver. Ready to update your copy of TPC?